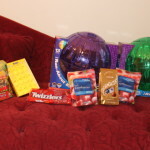 What would make an Easter Basket so much fun that children of all ages want to have one? More than just having one, what would make everyone want to engage in the hunt to get that one basket that is made especially for them? The Easter UnBasket Hunt!!! Let’s talk about the UnBasket! Spending the average $25 on an Easter basket, that has little to no use; and may end up as clutter and trash sounded less than inviting to me as a young mother. I wanted a memorable holiday that would make each of my children (and anyone else who joined us for the occasion) feel special. 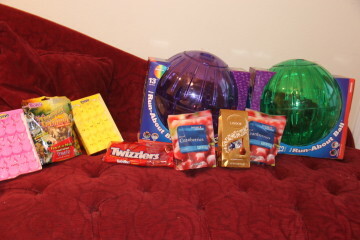 So, in our family, we use our Easter baskets throughout the year; because they are never baskets. Have you ever heard the expression, “it’s all about the packaging?” Last year, my daughters’ baskets were each handbags; and my son received a tennis racquet bag. Every year, I fill each of their “baskets” with dried fruit, trail mix, our favorite chocolates and a few other miscellaneous goodies. I typically go very light on the sugar; and heavier on the fruit and nuts. No one complains because the basket is so much more exciting than the contents! Each basket is special, because it is something that the recipient really wants that is uniquely purchased or made for them. Because my 17 year-old has two chinchillas, her basket this year is a large chinchilla exerciser ball (which she wanted). To avoid spoiling this year’s surprises, let’s talk about years past. Barbie Jeeps, Tonka trucks, jewelry boxes, tool boxes, children’s suit cases, bike helmets, shoes (in the boxes), denim jackets (pinned bottom; arms tied, buttoned up), coffee or tea pots, canisters, beach towels or yoga mats (rolled up with goodies inside; tied with a bow), hats, art boxes (with supplies), water igloos, and even children’s bikes (with the cute basket) make wonderful UnBaskets! Those big plastic boxes of Lego’s are great; because there is room on top of the Lego’s for treats! 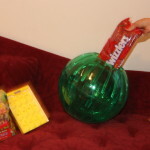 Anything can be a basket, even if you have to tape candy to it! Think about what each person would enjoy that fits your budget. You will find a lot of options that are $25 or less. And with the basket being so cool, you can invest in a few quality contents, rather than worrying about quantity. It’s all in the delivery! I make everyone hunt for their basket; and each person’s search is unique. I write a series of 5 clues, each one leading to the next, until they get their UnBasket. Make the clues fun and encouraging. If the next clue is in the freezer, the clue might read, “I love chillin’ with you.” If its behind the piano, “your voice is music to my soul;” or “you are “note” worthy.” If its for a significant other, put a note in the oven; and write, “you get hotter every day.” If your child is good at something, tie it to a clue. Make each person feel great; and make it funny when you can. Some of my past humor is too personal to make public; and I am sure you will create some of your own. Your loved ones will be saving their clues; laughing with each other about them; and smiling at you, keeping some of them just between the two of you. Everyone has fun and feels special; and the day is more than a little memorable. Remember, you are the CEO of your own life. Take ownership of every day and every opportunity. Make life fun!